All is seemingly quiet for the Detroit Lions as the slow period in the NFL begins to wind down prior the start of training camp. The Lions will look to new head coach Matt Patricia to help get them over the hump as they’ve finished each of the past two seasons at 9-7. While there are many interesting storylines surrounding the team, arguably the biggest one will be how the first-time head coach performs as the leader of a franchise. Despite the head coaching change, the Lions return offensive coordinator Jim Bob Cooter and their top-four receivers from 2017, which is a great sign for QB Matthew Stafford and the passing game. Stafford ended the 2017 campaign with an overall PFF grade of 83.3 – down from 85.9 a season ago but finished with a Tier 1 passing game supporting cast. In a story of ups and downs, Stafford had six games last year with a grade above 80.0, but also had five games at or below 55.0. Although the Lions were in playoff contention for most of the year, the team could only go as far as Stafford took them. That said, over the last two seasons, Detroit’s front office spent a lot of money and resources to make sure they bolster the offensive line. After signing right guard T.J. Lang and right tackle Rick Wagner last offseason, the Lion’s drafted our top-rated college center in Arkansas’ Frank Ragnow, in the first round of the 2018 NFL Draft. A three-year starter for Arkansas, Ragnow checks all the boxes for an elite interior offensive lineman. The Lions have to get better success from their running game, and Ragnow should help provide that immediately, as evidenced by his 92.5 run-blocking grade and his 94.6 percent run-block success rate (first among draft-eligible centers) in 2017. All of this, coupled with (presumably) a healthy Taylor Decker, gives the Lions the potential to have one of the better offensive lines in the NFL. In 2016, Decker’s rookie grade of 80.7 ranked 25th among offensive tackles in the league and was the fourth-highest grade ever for a Lion’s rookie in the PFF era. The injection of Ragnow and a healthy Decker pushed the Lions to No. 8 in our preseason offensive line rankings, after finishing 19th in our season-end rankings. Provided that they can stay healthy, this could arguably be the best offensive line that Stafford has played behind in his career. In 2017, Stafford had the second-most pressured dropbacks of any quarterback (229). While he actually performed well under pressure – averaging 7.3 yards per attempt and earning a passer rating of 76.7 – his overall stats did slightly regress. Of all quarterbacks drafted since 2006 (minimum of 100 attempts), Stafford has the third-most career passing yards under pressure. The Lions are hoping that the investments they’ve made in the offensive line over the last two years will help keep their franchise quarterback clean from pressure as few passers were better when throwing from a clean pocket than Stafford in 2017. He finished in the top 10 in passer rating (109.4), completion percentage (71.9) and touchdowns (23) last season when kept clean. All eyes will be on the running back position come the open of Lion’s training camp. At the start, it seems as if neither of the positions on the depth chart are locked in place, so intense competition for playing time may ensue. The Lions bring back three running backs from a season ago in Theo Riddick, Ameer Abdullah and Zach Zenner – all of whom could vie for snaps. Riddick holds two of our 12 best seasons in missed tackles forced per reception, and his 36 missed tackles forced after the catch in 2015 is the PFF record by a running back. So while he may not be much of a threat on the ground, the Lions are likely to continue utilizing Riddick in a similar pass-catching role moving forward. Despite testing as one of the most athletic backs in the 2015 NFL Draft Combine, Abdullah has never been able to garner a workhorse role for the Lions. With Abdullah entering the final year of his rookie contract, touches will be even harder to come by – especially after the team signed LeGarrette Blount to be the bruiser on first and second downs – a role he performed quite well in 2017, averaging 3.56 yards after contact per carry (highest average among running backs with a minimum of 150 attempts). Another lock to make the roster at the position, Detroit spent a second-round pick on Kerryon Johnson out of Auburn. In 2017, Johnson was ranked fifth among draft-eligible running backs with an overall grade of 87.9 and tied for fifth most missed tackles forced among his draft-class peers. Make no mistake about it, the signing of Blount and the early draft picks of Ragnow and Johnson, have us believing that the Lions, for the first time in a long time, are set on taking some pressure off Stafford, both literally and figuratively. Not only should Stafford be able to play behind a better offensive line and with an improved running game, the Lions boast one of the best wide receiver groups in the NFL. Led by run-after-the-catch phenom Golden Tate (a league-best 22 broken tackles for receivers in 2017), his 86.4 overall grade ranked seventh in the league. The Lions utilized an interesting dynamic between their top-two wideouts last season. Tate led the NFL in most targets at or behind the LOS while Marvin Jones led the NFL with 16 deep receptions. Not only was Jones dynamic in the deep-passing game, he was one of the best receivers in the league on third and fourth downs last season. He was one of only two wide receivers to have two touchdowns on contested targets on third or fourth down. With Tate’s contract expiring at the end of the season, Detroit may have to dish out some capital to keep the unit intact. Behind Tate and Jones, youngsters TJ Jones and Kenny Golladay have already proven the can be depended upon when their number is called. Jones rounded out 2017 with an overall grade of 77.5 (34th) and Golladay finished the year with a 104.3 passer rating when targeted (20th). Ziggy Ansah will be playing the 2018 season under Detroit’s franchise tag. Although he did not put up a ton of pressures last year (37), he did so on just 297 pass-rushes, giving him a 10.3 pass-rush productivity – good enough for 15th in the league among 4-3 defensive ends. Ansah also finished last season ranked second in sack percentage at a rate of 29.7 percent (11 sacks on 37 pressures) and rounded out the year with an 80.2 overall grade (40th) and a run-stop percentage of 7.8 percent (30th). 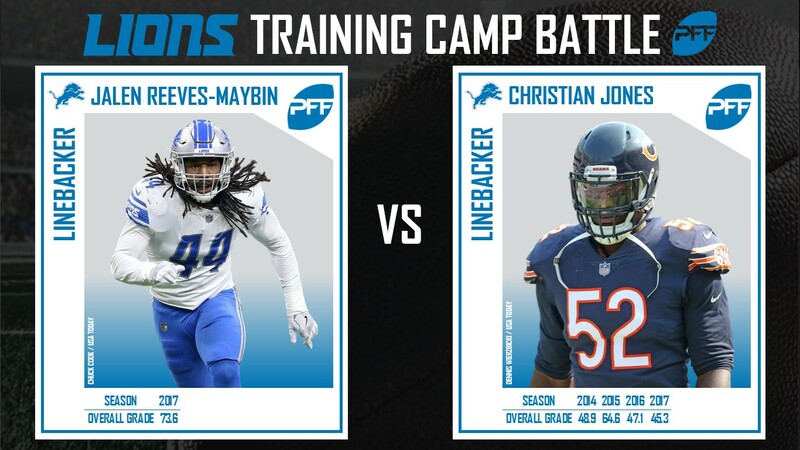 Outside of last year’s first-round selection LB Jarrad Davis, there’s still plenty of question marks surrounding the front seven for the Lions. Patricia and defensive coordinator Paul Pasqualoni’s scheme is expected to be a multiple-front defense, so it is likely to see some elements of both 3-4 and 4-3 concepts. If this is the case, there will be very few defined roles ahead of training camp – especially along the defensive line. Players like Anthony Zettel, Cornellus Washington and Kerry Hyder Jr., all listed as defensive ends, could impress with their size (each over 270 pounds) and their versatile skillsets – particularly in more of a two-gap concept. Jalen Reeves-Maybin will likely battle it out with newly-acquired Christian Jones opposite Davis. On the interior of the defensive line, the Lions lost their top defensive tackle Haloti Ngata to free agency. Although only playing just 145 snaps in five games before an elbow injury ended his season early, his 79.7 pass-rush grade was the highest on the team among interior defenders and Detroit will be looking for multiple interior players to step up in training camp. A’Shawn Robinson and Sylvester Williams are two players that are expected to see a lot of time on Detroit’s defensive line. Both were quality interior defenders last season – Robinson produced an overall grade of 78.6 (57th) and Williams produced an overall grade of 76.5 (67th). Behind them, there will be plenty of competition. Jeremiah Ledbetter played in all 16 games for the Lions last season and is expected to be a rotational tackle behind Robinson and Williams. After him, it will be interesting to see who steps up in training camp. As it currently stands, the Lions have great talent in the secondary ahead of training camp. In 2017, Darius Slay led the NFL in interceptions with eight (tied with Kevin Byard) and led the league in total pass breakups and interceptions combined with 21. In fact, of all cornerbacks since 2015, Slay is No. 1 in the league in playmaker index (17.7). The Lions will be hoping that Teez Tabor, the team’s second-round pick last season, is the long-term plan at opposite of Slay. After playing a limited role as a rookie, Tabor will be expected to produce similarly to what he did in college where from 2014-2016, he had 23 pass breakups, nice interceptions and never allowed a passer rating above 53.4 when targeted over the course of a season. 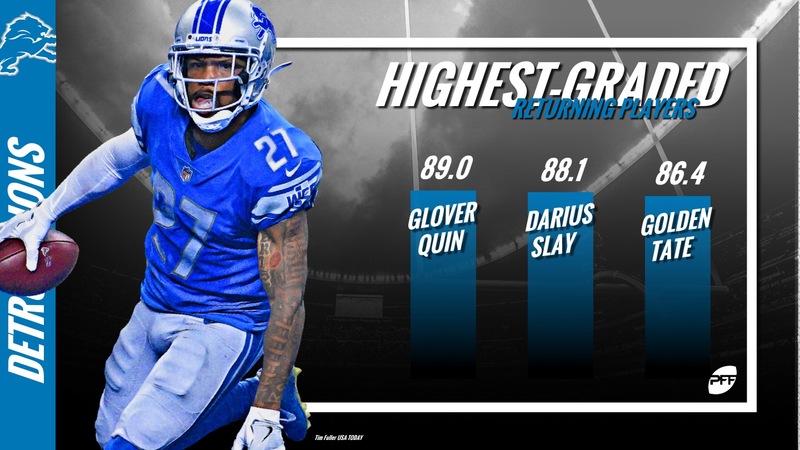 Another star in the Detroit secondary, safety Glover Quin put together a career year in 2017. Quin was a force both in coverage and against the run, setting a career-high in defensive stops with 27. When targeted in primary coverage, Quin allowed a passer rating of just 55.4 and surrendered just 7.1 yards per reception on those plays. Overall, Quin ranked seventh in the NFL among safeties with 0.19 yards per coverage snap allowed. Opposite Quin, Quandre Diggs looks to be locked in to other starting safety spot. His versatility (463 snaps in the slot in 2017, first in the league among safeties) will be extremely important for his defensive-minded first-year head coach. Cornerback – Who emerges opposite Slay? Linebacker – Who are the third and fourth linebackers?